RAMALLAH, West Bank (CNN) -- The United States will wait until a new Israeli government is in place before it addresses key issues that have stalled the peace process with the Palestinians, Secretary of State Hillary Clinton said Wednesday. Secretary of State Hillary Clinton talks with Palestinian students Wednesday in the West Bank city of Ramallah. 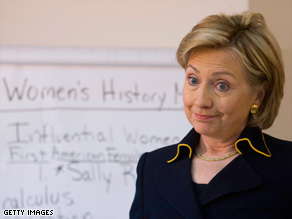 But Clinton also vowed that President Obama will not be slow to make the issue a top priority. "We cannot afford more delays or regrets about what might have been had different decisions been made in the past," Clinton said at a joint news conference with Palestinian Authority President Mahmoud Abbas. "The Obama administration will be vigorously engaged in efforts to forge a lasting peace between Israel, the Palestinians and all of the Arab neighbors." She spoke after talks with Abbas and Palestinian Prime Minister Salam Fayyad in the West Bank city of Ramallah. A day earlier, she met with Israeli leaders in Jerusalem, including Prime Minister-designate Benjamin Netanyahu. Clinton said she would wait until Netanyahu has formed a government before addressing the expansion of Israeli settlements in the West Bank, which she called "unhelpful and not in keeping with [international] obligations." Throughout her trip, Clinton has stressed that the new U.S. administration is not willing to abandon the idea of an independent Palestinian state as part of a peace agreement. "The United States through President Obama is committed to a comprehensive peace including a two-state solution," Clinton said. "I have said that publicly, I have said that privately. There is no difference in any message." She said once Netanyahu has formed his government, the U.S. special envoy on Mideast peace, George Mitchell, will return to the region to begin meetings. "We are not waiting; we are moving forward, and we believe that there will be very constructive talks with the new Netanyahu government," she said. Her talks with the Palestinian leadership in the West Bank are the first for the Obama administration. Clinton is on her second overseas trip as secretary of state following a tour of Asia last month. On Monday, Clinton attended a Gaza donors conference hosted by Egypt in the Red Sea resort city of Sharm el-Sheikh. She announced that the United States has pledged $900 million to help the Palestinian people and support the Palestinian government in the West Bank. The State Department said up to $300 million of that pledge has been earmarked for urgent humanitarian needs, particularly those in Gaza. Another $200 million is to support the Palestinian Authority's budget shortfall for 2009, and the remaining $400 million will go to educational and institutional reform in the West Bank, State Department spokesman Gordon Duguid said. The pledge -- which Congress must approve -- has been "designed in coordination with the Palestinian Authority" to ensure the money "does not end up in the wrong hands," Clinton said Monday. She was referring to Hamas, the group that rules Gaza and which the United States has designated a terrorist organization. The United States and Israel regularly negotiate with the Palestinian Authority, which is based in the West Bank and is led by Abbas, whose Fatah party is a bitter rival of Hamas. Obama has not ruled out talks with Hamas but said the group first must renounce violence, recognize Israel and abide by previous agreements that successive Palestinian governments have reached with the Israelis. Clinton's weeklong trip to the Middle East and Europe also is focusing on NATO and relations with Russia. She then heads to Ankara, Turkey, for talks with key leaders before returning Saturday to the United States. This week's trip is an effort to "take the pulse of various leaders" on peace in the Middle East, State Department spokesman Robert Wood said. Israel recently ended a three-week military campaign in Gaza to stem rocket attacks. Despite the operation, Israel and militants in Gaza continue to trade fire. Egypt has been trying to broker a broader peace deal to reopen Gaza's borders, which have been under an Israeli blockade. Israel has allowed limited humanitarian supplies into the Palestinian territory, but international aid organizations operating in Gaza said the move is not enough. Israel has said it must maintain the border closure and blockade of Gaza's seaports to prevent weapons from entering Gaza. Egypt, which also shares a border with Gaza, has not reopened the Rafah border crossing. Israel is demanding that Hamas release a kidnapped Israeli soldier before it fully reopens the border crossings with Gaza. But Hamas has rejected including the release of Gilad Shalit as part of a cease-fire negotiation with Israel.